Buy 36 or more for $7.59 each. 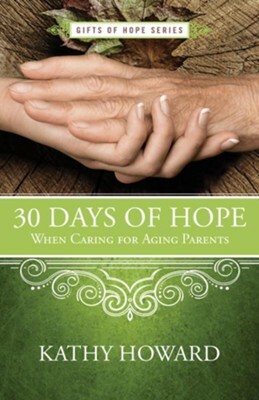 In 30 Days of Hope When Caring for Aging Parents, author and fellow caregiver Kathy Howard offers the encouragement needed as you strive to care for your parents in a way that pleases God and shows them honor and respect while maintaining their dignity. Through Scripture passages, prayer prompts, and Kathys personal stories, be strengthened in the knowledge that the giver of all wisdom will empower you in the daily moments when you are caught between being your parents child and their caregiver. Kathy Howard encourages believers to live an unshakeable faith for life by standing firm on our rock-solid God. The author of nearly ten books and a former cultural Christian, Kathy has a masters degree in Christian education. Kathy and her husband have three married children and four grandsons. For more information and free discipleship tools and leader helps, visit www.kathyhoward.org. I'm the author/artist and I want to review 30 Days of Hope When Caring for Aging Parents.